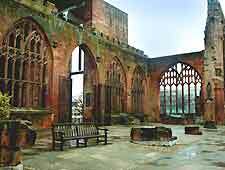 Coventry's history stretches back to the Anglo-Saxon era. A convent was thought to have been established here in the 8th century AD. Dedicated to St. Osburga, it stood in the grounds of St. Mary's Priory. It's also believed that in the 11th century, Leofric and his wife Godiva founded a Benedictine monastery here. Legend has it that Lady Godiva rode naked through Coventry in a protest against the heavy taxes set by her husband, although there's no real evidence to back this up. The origins of the city's name are also rather uncertain. Many people believe that its name derives from 'Coven' and 'tre', the Celtic words for 'convent town'. Another theory points to an early settler known as 'Cofa', who marked the boundary of his land with a 'tre' or tree. Earliest mentions of a settlement here refer to a place called 'Couaentree', or 'where the waters meet'. 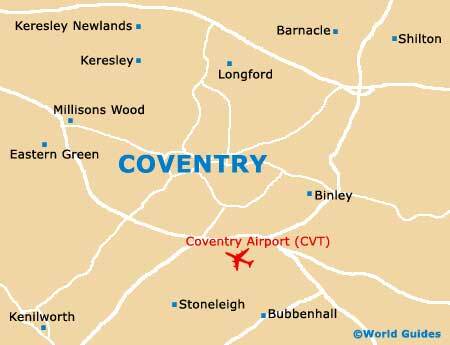 Coventry grew up as a town of two halves. In the north, the head of the monastery held control, whereas in the south, it was the Earl. Gradually, religious influence in the town declined. In 1329, King Edward III granted Coventry the permission to collect taxes to fund the building of a town wall. It's believed that the town was considered wealthy enough to be counted as a strategic target. Work on the wall didn't begin until 1355 and it wasn't to be fully completed until around 1534. Most of Coventry's ordinary folk at this time were engaged in activities such as weaving and cloth manufacture, leather working and shoe making. By 1340, the town's merchants had gathered themselves together to form a guild. St. Mary's Hall was built and the guild soon began meeting here on a regular basis. As was the case in many English towns, the 16th and 17th centuries brought mixed fortunes. Under Henry VIII's religious reforms, it lost its Franciscan friaries and priory. There were intermittent outbreaks of plague to contend with. Then, in 1642, civil war broke out in England and King Charles I attempted to enter Coventry with his Royalist forces. He did not succeed, however, and it remained a Parliamentarian town throughout the war. With the restoration of the monarchy, in 1662 King Charles II ordered the destruction of Coventry's walls. In the 18th century, the city's wool industry was in decline. It was replaced by silk weaving, particularly for use in ribbons. Other changes included the destruction of the city's ancient gates in order to ease the flow of traffic. Such urban improvements were to continue into the 19th century, including the arrival of the railway in 1837. Pressure on living and working space within the city led to the extension of its boundaries. By 1900, it had grown to include Earlsdon, Chelysemore, Radford and Foleshill. Life in Victorian Coventry gradually improved. Much of Coventry's rich heritage was to be lost in a single night during World War Two. A German raid took place in November 1940 that was to have dire consequences. Known as' Operation Moonlight Sonata', the raid led to the loss of many lives and buildings, including the city's cathedral. In 1942, plans to build a new cathedral were first put into action. The plan by eminent architect Sir Giles Gilbert Scott aimed to incorporate part of the old ruins. However, after a competition held in 1950, it was decided to go ahead with a different design. Its winner was Sir Basil Spence, who took a radical new approach, breaking away from traditional cathedral design. Work began in 1954 and Coventry's new cathedral was finally consecrated in 1962. Just five days afterwards, the War Requiem, a piece of music written by Benjamin Britten, was performed here.